It’s another of those zany Paradise Towers/Happiness Patrol stories, turning something mundane into a futuristic dystopia. Concept: a planet-sized car park with overworked parking wardens, overbearing robot sentries, and tribes of angry natives. Even the vehicles are getting uppity. Warden: We can’t have you wandering around when you’ve potentially committed a very serious crime, now can we? Warden: On a planet dedicated to parking, that’s one of the most serious crimes there is. Ace: I reckon I could show you a few others. As you can tell, this audio doesn’t take itself entirely seriously, despite the body count. Explosions, angry robots, snark and sass, holding cells, running while being shot at, hiding in air ducts: yep, it’s absolutely classic Classic Who. So is fictionalising a new real-world technology and exaggerating it to show its drawbacks. It’s funny how often SF exhibits a luddite bias. 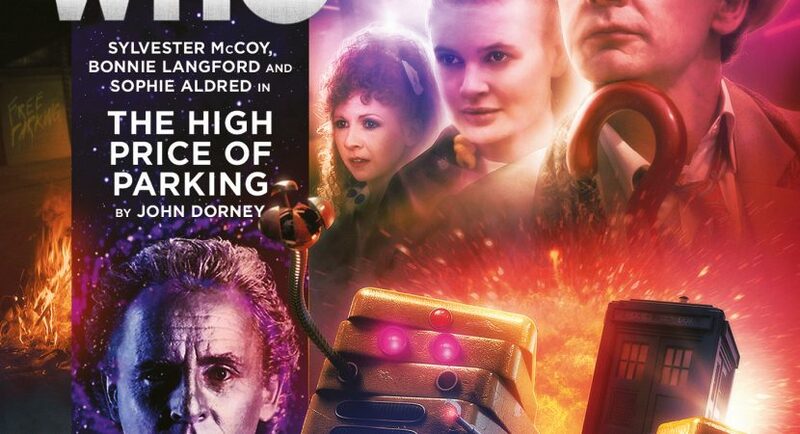 The great thing about this story is that Mel and Ace each use their particular skills to help save lives, while the Doctor’s job is to find and neutralise whoever’s behind the attacks. That’s a tidy way to let the Doctor save the day while the companions also make vital contributions. They’d better, because most of the inhabitants of planet Parking are not the sharpest bowling balls in the rack. The High Price of Parking is very much in the style of Season 24. Sophie Aldred picks up on this, suggesting in the interviews that it’s early Ace, shortly after she and Mel first meet. Both Ace and the Doctor feel pre-Hex and possibly pre-Colditz, back when Ace was still a sassy teenager packing explosives, although perhaps it’s just that teaming up with Mel is reminding her of her roots. At any rate, there’s an easygoing chemistry between our three regulars that makes me wish they’d shared more TARDIS time on TV. Is it just me, or was the”free parking!” battlecry a spoof of “free time!” in the Gallifrey series? Science fiction has been hitting the brakes and asking, “Are we sure this is a good idea?” ever since Frankenstein. Big Finish is no exception. Off the top of my head I can think of recent audios critical of ebooks, digital assistants, mobile devices, social media, online shopping, video games, and now self-driving cars. On the one hand, “dangers of technology” is a go-to 21st-century bogeyman, and it often saves the Doctor having to kill somebody. On the other hand— as someone with arthritis and vision problems— sometimes I want to say, “Enough already.” What SF paints as technological demons are very often a godsend for the disabled and/or elderly. On the third hand, updating the Terminator myth to posit self-driving cars as the robot revolution is inspired. And the ethical dilemma of what to do if/when our AIs become self-aware is no joke. Whoops, I’m getting deep on a story that’s the lighter side of Big Finish. Back to High Price of Parking. Technophobia notwithstanding, I love the tongue-in-cheek concept that people who can’t remember where they parked would wind up becoming a lost tribe.